Retaspimycin hydrochloride, IV-administered small molecule, semi-synthetic analog of natural product geldanamycin, water soluble >200 mg/mL, administer as 30 min infusion. 10 patents on this and related compounds expire 2024-2025 (see structure below). 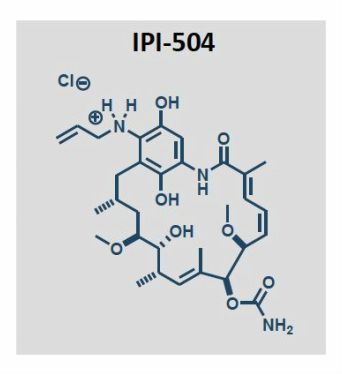 12/2008 rights to IPI-504 and IPI-493 returned by Medimmune (partnered 8/2006 for $70m upfront, $430m milestones while in p1, 50/50 cost sharing)- would owe mid-single digit royalties (6/2011 CC). 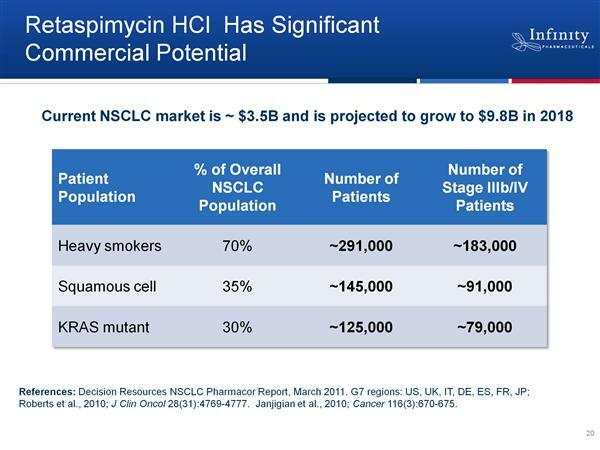 --Originally started as broad solid tumor p1 then expansion cohort of 23 patients for NSCLC in late 2009 (weekly iv at 300 mg/m2, docetaxel every 3 weeks at 75 mg/m2). --Preliminary data presented at ASCO 2009 (57 pts total, dose 400 mg/m2 twice weekly for two weeks, off drug third week, overall response rate 7% with all responses seen in EGFR wild-type patients...Click here for poster reprint and click here for a powerpoint slide deck with much of the same data-easier to view). --Adaptive, randomized, placebo-controlled design in ~100 2nd/3rd line patients (must be docetaxel naive), 75 mg/m2 docetaxel +/- IPI-504 at 450 mg/m2 weekly. --Affintor aka everolimus, is an mTOR inhibitor. 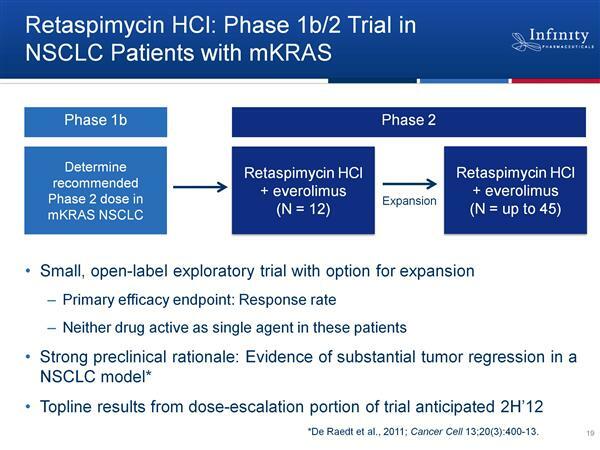 NSCLC pts with k-Ras mutation. Endpoint is overall response rate. --8/2011 2q11 CC: Synergy/tumor regression seen in mouse model. 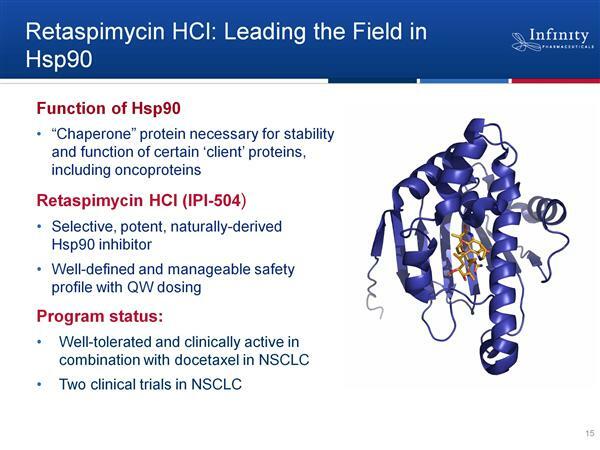 --EGFR is HSP90 client, so used IPI-504 twice weekly after EGFR inhibitor therapy failure. Obtained tumor biopsy sample for molecular analysis. Dataset contained: EGFR (40 WT, 28 mutant); kRas (26 WT, 12 mutant); ALK (12 WT, 3 rearranged). 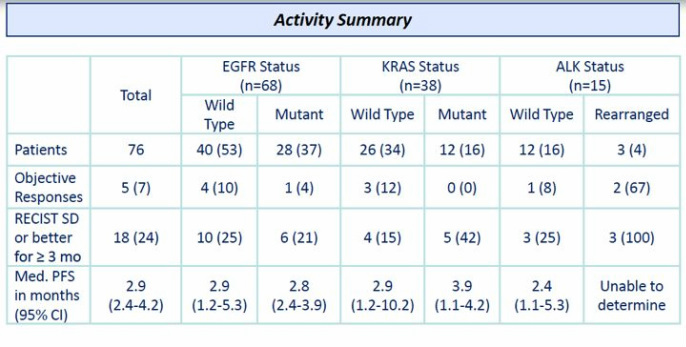 See poster for waterfall response plots - seems to be little correlation to EGFR or KRAS mutant status. --Starting dose was 400 mg/m2, later decreased to 225 mg/m2 based on toxicity in a different study. --Data was reported at ASCO 6/2010 ( Click here for poster reprint) and published in JCO 2010. --2010 interim review of first cohort (300 mg/m2 weekly- clinical activity but insufficient to meet go criteria, blame un-optimal dose). 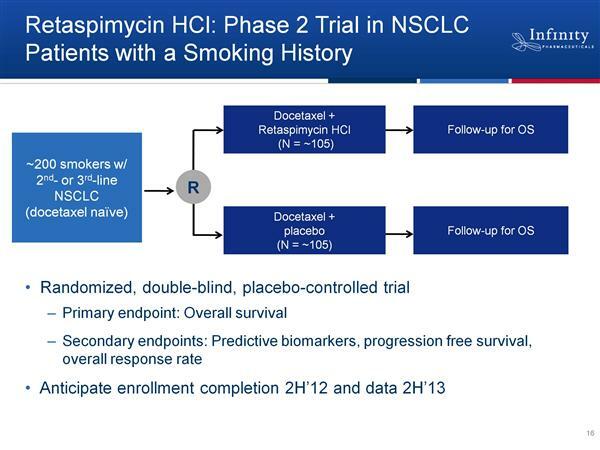 -- Final results presented at ASCO 6/2011 (Click here for abstract): 1 PR and 14 SD (1 over 6 months) among 26 pts treated, no dose-limiting toxicity. Did not meet pre-specified criteria to expand trial. Phase 3 trial in GIST (initiated 10/2008) - HALTED 4/2009 after only 46 pts because imbalance of deaths - greater in treated arm. Dosing was 400 mg/m2 twice weekly iv for two weeks followed by one week off (Click here for clinicaltrials.gov listing). Previously 5/2008 p1/2 GIST data- 36 pts, single arm (3% PR, 67% SD) led to this phase 3 initiation.